MMT does differentiate between saving (in the flow of funds it is the change in net worth: ΔNW) and net saving (saving less investment). Net saving shows how the accumulation of net worth occurs beyond the accumulation of real assets. For the domestic private sector, this comes from a net accumulation of financial claims against the government and foreign sectors. • Pace T&W, there is no “saving” measure in the Fed’s flow of funds accounts (FOFAs) that equals ΔNW — whether you’re talking net or gross saving (with or without consumption of fixed capital), including or excluding capital transfers. • The “net saving (saving less investment)” bruited in that paragraph is confusingly at odds with the existing definition of the term as used in the national accounts — gross saving minus consumption of fixed capital. • “Net accumulation of financial claims” does not appear anywhere in the national accounts, and has an uncertain relationship with a measure that the FOFAs do provide: “Net acquisition of financial assets.” Are these the same measures? If not, what is their accounting relationship? Surplus from production (how “surplus” is commonly used in the national accounts), monetized by the markets for newly produced goods and services. 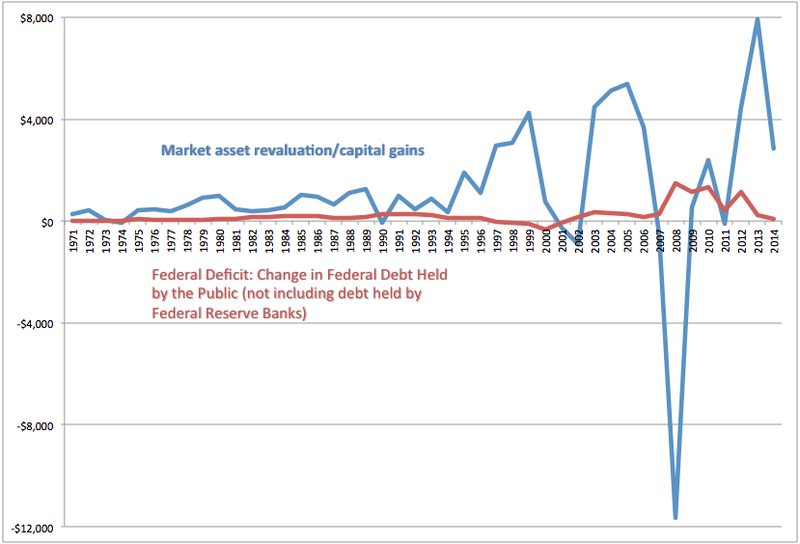 Revaluation of existing assets — assets produced in previous periods — realized in the existing-asset markets. I would even go so far as to say that these are the primary mechanisms whereby “money” is created. 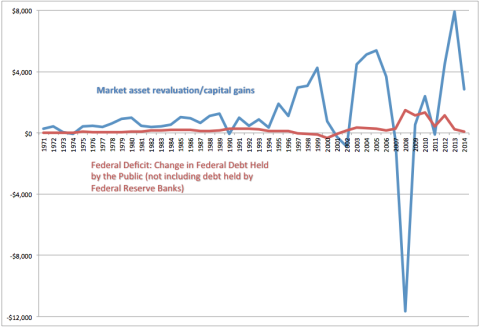 Deficit spending is small beer compared to cap gains. Asset markets go up, and there’s more money. This eschews the widespread confution of money with “currency-like things,” suggesting rather that all assets — which since they exist on balance sheets are necessarily designated in a unit of account — embody “money.” As an aid to untangling the confusion that I still find inherent in MMT discourse, I offer up the following taxonomy of sources for household income. It’s explained in detail here. Here’s what that looks like in an accounting statement, using IMA data: Before you raise objections, I point you again to further explanation of this construct, here. Like Armour et. al., I use a measure labeled “Comprehensive Income” that includes accrued, marked-to-market capital gains. I go a step further, however, and propose another measure based on that, a residual of sources and uses: “Comprehensive Saving.” That measure has a singular virtue: it equals change in net worth. “Primary income” — the vestige of the NIPA’s “income” measure that is carried over into the FOFAs and IMAs (but properly labeled as “Balance of primary incomes”) — is given as an addendum measure. The measure here varies from the FOFAs/IMAs only in that interest paid is not deducted from income; it’s tallied under Uses. Comprehensive Saving does not, of course, equal government deficit spending. (Nor does Primary Saving.) Such spending contributes to private-sector saving, but it’s not even vaguely identical. Before concluding, I’d like to touch on private-sector bank lending. (Modern Monetary Realists, are you listening?) Its direct effect on net worth is zero. It creates new assets — bank deposits. But unlike government deficit spending, it also creates equal and opposite offsetting liabilities on both the borrower’s and the bank’s balance sheets. Both balance sheets expand, equally on the left and right sides. So the act of private lending itself creates new assets, but it doesn’t directly, in accounting terms, increase private-sector net worth. But: borrowers use many of those loans to create real assets — goods, capital — that are then sold at a higher value (or marked to market at a higher value). 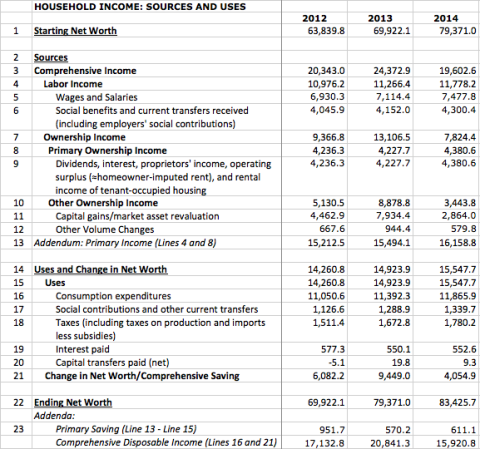 That markup increases private sector net worth, and private lending is a huge catalyst for that process. But that is an economic effect, not an accounting identity. So yes: private bank loans create new private-sector assets, and they have the indirect economic effect of increasing net worth, but they don’t, directly and in and of themselves, increase private-sector net worth. Government deficit spending does. MMTers are right that it’s special in that way. What they’ve missed — or caused many of their followers to miss — is that it’s not the only thing that’s special in that way. Really, it’s not even close: Runups in stock and real-estate markets create new wealth, net worth, “savings,” money, out of thin air — just like deficit spending, but by a different mechanism. The markets create money too. Cross-posted at Asymptosis. But they do! We have begun to see arrangements whereby education debt is repaid as a fraction of income. These arrangements are presently uncommon, but they exist and may become more common as we go. If you have pledged a share of your income to a firm in return for their otherwise forgiving your debt, how is that different from selling the firm equity in yourself? I register BruceCo with the Secretary of State of NM and issue 100 shares at $10 par. I sell 90 shares of BruceCo to my friends in a version of an IPO at $20 per share. BruceCo’s market value has just gone from nominal $1000 to a real $2000. I turn around and sell one of my 10 shares to the Venture Buzzard firm DumbCo for $1,000,000,000. I now have a net worth of $9,000,000 and my ‘firm’ has a market cap of $100,000,000. Making my initial ‘investors’ ‘wealthy’. Scale this up and billions of dollars of investment “value” and “financial assets” can be created by movement of 1% or less of shares. And Wall Street likes to screech about “fiat money”! The idea that this ‘net worth’ equates in any way to ‘money’ is more than faintly ludicrous. Because all these numbers would be the same if the product of BruceCo was a functioning perpetual motion machine or a napkin with a drawing. But is any of this really “a net acquisition of financial assets” in the way Steve critiques? Accounting is scoring. In a game that is always tied. By definition. That doesn’t impart some real world meaning the the line item called “assets”. Ask Don Trump how that works, he simply values his ‘brand’ at $3 billion and boom! it transfers over to net worth. Because books gotta balance. A suggestion : If we do decide that a new bubble is the best route to sustainable growth and full employment , let’s do it using an asset that can be purchased by rich and poor alike , so as to spread the distribution of gains across classes. Real estate and stocks don’t really fit the bill in that regard. Tulip bulbs or Beanie Babies might work well. After everyone loads up on the chosen asset , the Fed can start buying them up at inflated prices , and , with a little luck , we’ll be on our way to widespread prosperity. That is exactly why I reject MMT. I don’t find it blatantly wrong but I find it severely misguided in its focus on intermediate financial forms of wealth instead of what is really the ultimate real source of wealth: capital and goods creation. When you build a balance sheet you easily see that some of the components MMTers find important simply cancel out on the aggregate. I don’t want’ to completely dismiss the importance of loans and such but they are just intermediate steps to actual goods and capital creation. Agreed, B.E. The problem with such market-value assessments is that the trade is zero-sum on the market. Not if you borrow against that “asset”. We have entered a world where the whole concept of a P/E ratio has become almost meaningless for many firms – because they don’t have ‘earnings’. ‘Revenues’ maybe, in the case of Amazon almost beyond measure, but that doesn’t necessarily translate to ‘profits’. None of which stops Jezz Bezos from being able to finance purchases like the Washington Post. And lots of Tech Bros from buying yachts and mansions by monetizing some idea that hasn’t actually earned anyone anything in terms of gross or net profit from goods sold. You know the kind of stuff they teach you in Intro to Financial Accounting. No, Bruce, even if you borrow against that “asset”, someone has to put in the money you’re borrowing. Apologies for not participating here. The comments on Asymtposis and twitter have sort of overwhelmed me. And even more so, the current comment thread on Interfluidity, which is simply awesome. If you really want to understand net worth in the national accounts, and have some time (100+ comments and counting), run don’t walk.